If you follow me on Twitter you may already know that I went away on holiday to Portugal with my fiancé last week. As the weather over there is, of course, a lot warmer and sunnier than the UK, picking up some sunscreen, after-sun and insect repellent was essential. No matter what the brand, I think those are all things anyone travelling abroad, particularly to anywhere warm and sunny, needs to consider taking with them (we're talking specifically about natural products here of course)! For sun protection, I picked up the SPF30 Sunscreen Spray from French brand Lovea, which was on sale in my local Whole Foods. It has that sunscreen smell, but it's a more subtle scent than others I've tried in the past. The formula is non-greasy and water resistant, using biodegradable mineral filters to protect skin from sun exposure (no nano-particles). I do find it leaves a slight white cast on the skin, but it's only minimal and can be combated by taking the time to rub it in more thoroughly. This sunscreen did a great job of protecting my skin from the sun all week and I only got a tiny bit burnt on the last day, through my own fault of missing a little patch on my arm! The only downfall is that it leaked through the spray nozzle in my suitcase on the way home, but luckily it was safely inside a tili bag so it didn't affect the rest of my luggage! After spending the day out in the sun, Jason's Soothing 98% Aloe Vera Gel (120ml £3.69) was a total life saver! On our first day there, my other half forgot to use the sunscreen so he ended up with burnt legs. Aloe Vera is notorious for it's soothing effect so it really helped with the burning feeling and irritation and got a lot of high praise from him! I was using it as an after-sun to moisturise at the end of each day too, so we ended up finishing off the whole tube after just 5 days. An absolute essential! 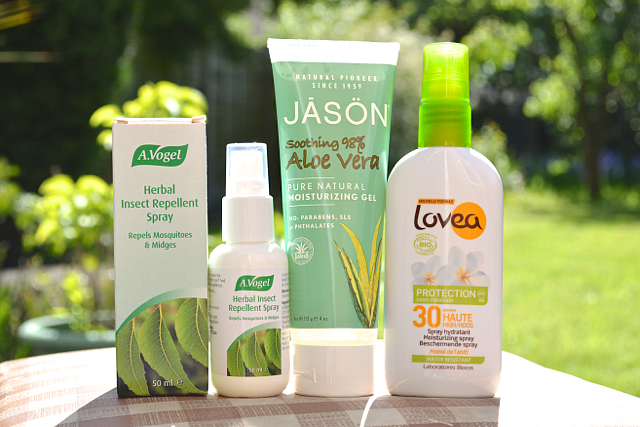 I also packed the A.Vogel Herbal Insect Repellent Spray (50ml £5.49) in my suitcase, to help ward off any mosquitoes that may bite in the evenings. The key ingredient is Neem extract, which masks the smell of your body to make it harder for the insects to find you and also deters them from biting by changing the taste of the skin. We didn't actually use this much at all, as we tended to stay indoors in the evening, but it's always handy to have something like this with you just in case! Have you tried any of these products before? What are your holiday essentials? Ohh I agree, aloe is perfect for soothing insect bites too! Excellent post! I'll probably be picking up one of these sometime soon! We always buy a big bottle of aloe vera on holiday. My sister has bad eczema which gets flared by sand and sun cream so it's a life saver.